CATHOLIC GIFT SHOP LTD - Lourdes Munrano Rosary Gift Set with Lourdes Water. 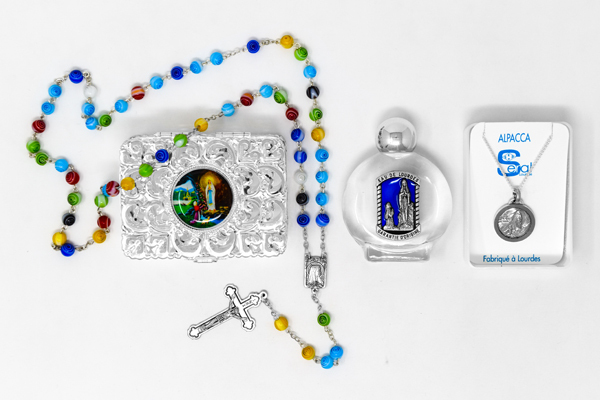 Lourdes Munrano Rosary Gift Set with Lourdes Water. > Lourdes apparition alpaca silver necklace depicting the apparitions and on the reverse is Our Lady of Lourdes. > Lourdes holy water bottle, measures 6.5 cm tall (2.5 inches). > Murano glass rosary beads and Lourdes apparition centerpiece, the rosary is 20 inches long.